Michael Chandler joined CCGD in 2008 as accompanist for the Apprentice Chorus. Mr. Chandler taught elementary classroom music for 16 years in Texas public schools, most of them in Lewisville ISD, where he was named Teacher of the Year at two campuses. He has directed and accompanied a number of children’s choirs and is the organist and pianist at Round Grove United Church (UCC) in Lewisville. Mr. Chandler has taught in Orff Schulwerk teacher education courses at universities in six states including Southern Methodist University in Dallas. In 2005, 2007, and 2013, his student ensembles performed by invitation at the annual TMEA convention in San Antonio. 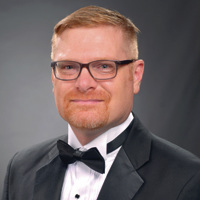 He has presented workshops, clinics, and sessions at local, state, and national levels, including TMEA, TCDA, AOSA (American Orff-Schulwerk Association), and numerous state music education associations. Mr. Chandler earned a Bachelor of Music in music education from Union University in Jackson, Tennessee, a Master of Music in piano performance from the University of Arkansas in Fayetteville, and the Master of Arts in music education from the University of St. Thomas in Minnesota. In 1997–1998, he was a Rotary Ambassadorial Scholar and studied piano privately at the Hochschule für Musik in Frankfurt, Germany. A winner of a number of competition prizes, he has performed as a concerto soloist with the North Arkansas Symphony Orchestra and the University of Arkansas Chamber Orchestra. In 1999 and 2003, he was a guest performer at the Mendelssohn-Haus Musiksalon in Leipzig, Germany. Mr. Chandler is currently a doctoral candidate pursuing the Ph.D. degree in music education at the University of North Texas in Denton.